Memorial Day Weekend is this weekend and a great way to enjoy the long holiday weekend is to visit some of the amazing sites in the National Park system! Washington D.C. and the surrounding areas in Maryland and Virginia is packed with all sorts of National Park units. There are 25 National Park units in the Washington D.C. area alone! From the majestic Lincoln Memorial to the Chesapeake and Ohio Canal National Historical Park, there is something for family members of all ages! A couple of years ago, my family took the Memorial Day weekend to do an epic National Park trip in 3 days. Below are a few of the highlights! 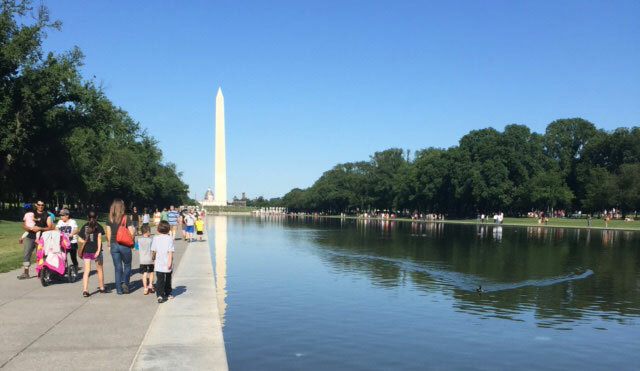 This post includes helpful tips and a sample itinerary in case you need some guidance in planning YOUR family’s trip to Washing D.C.’s National parks this Memorial Day Weekend! We made it to D.C. by 9:30 AM and found free parking nearby. Pro Tip: This lot is free but small. If you get there past 10:30 you will be SOL. This parking lot is great because you can park once and walk to Jefferson, FDR, and MLK memorials from there easily. The Jefferson Memorial is fantastic. – 2 Gift shops: the one closest to the Men’s restroom is specifically about Thomas Jefferson. The one closest to the women’s restroom is DC related. – The National Park Passport Cancellation Stamp location is at the bookstore closest to the Men’s restrooms. This memorial (and National Park) is a 10 minute walk from the Jefferson Memorial. This place caught me a bit by surprise as it was very extensive and we ended up spending a little more time here than I expected. In it, the memorial talks a lot about Roosevelt’s terms in office as well as the state of the union during those times of great depression and war. There’s also a great memorial for Eleanor Roosevelt. – When walking from the Jefferson Memorial you will be entering at the end. Take the sidewalk all the way to the beginning and walk through the memorial from start to finish. – There is a small display outside the bookshop that features a replica of the wheel chair that Franklin Roosevelt designed himself. After visiting the FDR Memorial we continued along the same path to the Martin Luther King, Jr. Memorial which was only a 5 minute walk away. This was a very impressive memorial with it’s bright white rock and massive statue of the Reverend. There are a lot of great features to this memorial so make sure you really look around to see some great quotes engraved on the surrounding walls. – There is a fantastic view of the Washington Monument from this spot. – The National Park Passport Cancellation Stamp location is across the street at the bookstore near the baseball fields. The next National park we visited is called President’s Park. Basically this is a visitor’s center and museum for the White House. This a place I had never been before and I definitely want to visit it again! It has everything you would want to know about the White House from the history of the building, the features of the building itself, as well as life at the White House. It is filled with interactive exhibits, detailed models, various video features, and a short documentary movie. – The most high-end gift shop for anything White House and president related objects including the limited edition yearly White House Christmas Tree ornament. 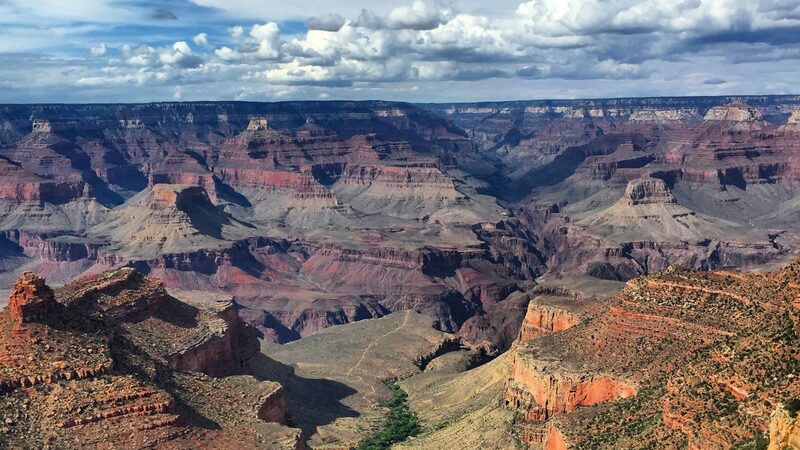 – The National Park Passport Cancellation Stamp location is at the information desk right when you pass through the metal detectors on the way to the restrooms. I have visited Washington D.C. many times and this was the first time I visited the Vietnam Memorial. This was an incredibly solemn and educational experience for our kids because we were there during Memorial Day and there were many veterans there. You cannot fathom how impactful this memorial is until you have walked along the path of the wall. – There were many volunteers there as well helping people find specific names. – The National Park Passport Cancellation Stamp location is at a large information kiosk between the Vietnam Memorial and the Lincoln Memorial. This was the reason we made the trip in the first place. My kids are history buffs and in particular, my 8 year old is obsessed with the Civil War. Last summer we visited a ton of Civil War-era places like Gettysburg, Appomattox Courthouse, Fort Sumter, and Richmond’s Tredegar Ironworks. We had tickets for the 2:00 entry. Even though our tickets had seats on it, there was no assigned seating. At 1:45PM we lined up outside the theatre. At 2:00, our tickets were scanned and we were let into the self-guided museum. The museum has everything you can possibly want to know about Lincoln’s assassination. There were exhibits explaining the mindset of the country as well as the disagreements. It also explains, in depth, the conspirators, their motivations, and their outcomes. 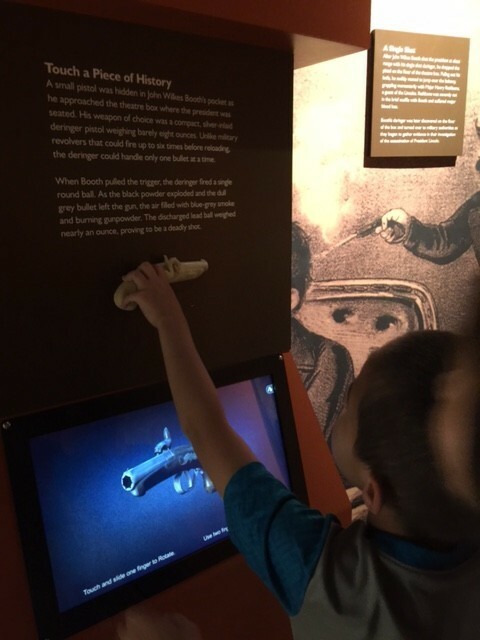 There was a cool exhibit where you could feel the size of the gun John Wilkes Booth used. After you spend some time at the exhibit, you journey up to the balcony of the newly renovated Ford’s Theatre. There, someone from the National Parks Service gives a brief introduction and answers questions from the audience. We were able to gain a great view of the balcony box where Lincoln was sitting. – It costs money and you should book early. When we were waiting in line to enter people were being turned away because it was sold out. Purchase tickets here. – Tours are staggered every 30 minutes. You can line up as late as 5 minutes before your time. – There is a parking garage right next door to the theatre that is a flat fee of $15 per day. There is elevator access from the garage straight into the theatre. – There are 2 bookstore/gift shops: in the Ford’s Theatre lobby and in the Center for Education and Leadership across the street. The one at the theatre also has a small snackbar. – Take your time at the exhibit downstairs. There’s a lot to see and once you leave you can’t return. – The National Park Passport Cancellation Stamp location is at the bookshop in the Ford’s Theatre Lobby. We had a pleasant surprise by stumbling across 2 additional National Parks in our travels. The first was Arlington House inside Arlington National Cemetery. This is the home of Robert E. lee that was taken away from him when he turned down the offer to lead the Union Army in the Civil War and, instead, join the Confederacy. As a result, the union took over his land and used it as a burial ground for the union army. This building was quite interesting. It had a full house worth of original 19th century furnishings and it was very interesting to hear about the Custis family that owned it. Did you know that Robert E. Lee was related to George Washington? – The National Park Passport Cancellation Stamp location is at the bookshop behind the house. This bookshop also carries the stamp of Washington Memorial Parkway as the Marine Corp War Memorial is the start of the Parkway. In all we actually saw 10 National Parks in 2 days with 8 of them being new! (We visited the Lincoln Memorial and the World War 2 Memorial for the second time). Along the way I shot some video footage and compiled it together in this short video. Check it out! I want to finish this post with one last note. I witnessed one of the coolest things this past weekend. It was my daughter concentrating on getting the perfect angle for a picture. I love to take photographs and to see her getting into photography is one of the most rewarding things imagineable. I took a picture of her taking a picture and out of this entire weekend, it will be the thing I cherish the most. View our family’s progress towards our goal to visit 100 National Park units by 2020 here! The French, the Spaniards, and a 6 Pounder Cannon! Adventure Beckons // Video of Our Pacific Northwest National Park Adventure!